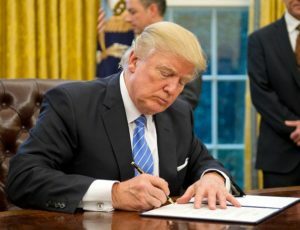 Among his flurry of week one executive orders, President Donald Trump is considering one that would drastically cut U.S. funding to the United Nations and other international organizations. A draft order titled “Auditing and Reducing U.S. Funding of International Organizations” calls for slashing funding to any UN agency or other international body that meets any one of several criteria, according to The New York Times, which obtained a copy of the order. “Those criteria include organizations that give full membership to the Palestinian Authority or Palestine Liberation Organization, or support programs that fund abortion or any activity that circumvents sanctions against Iran or North Korea,” the Times reported on Jan. 25. Trump’s draft order also calls for eliminating funding for any organization that “is controlled or substantially influenced by any state that sponsors terrorism” or is blamed for the persecution of marginalized groups or any other systematic violation of human rights. The order calls for then enacting “at least a 40 percent overall decrease” in remaining United States funding toward international organizations. Trump’s order calls for the establishment of a committee to look specifically at U.S. funding for peacekeeping operations; the International Criminal Court; development aid to countries that “oppose important United States policies”; and the United Nations Population Fund, which oversees maternal and reproductive health programs. The United States provides about a quarter of all funding to United Nations peacekeeping operations. Meanwhile, another executive order, “Moratorium on New Multilateral Treaties,” calls for a review of all current and pending treaties with more than one other nation. It asks for recommendations on which negotiations or treaties the United States should leave, the Times report said. The order says the review applies only to multilateral treaties that are not “directly related to national security, extradition or international trade.” The Paris climate agreement or other environmental treaties dealing with trade issues could potentially fall under this order, the Times report said.